Location of Manipur in India. Source; Wikipedia Commons. On January 15, 2019, at least 10 persons were wounded in a clash between protesters and Police at Khwairamband Keithel in Imphal West District. The clash occurred when people protesting against the Citizenship (Amendment) Bill, 2019, [first introduced as the Citizenship (Amendment) Bill 2016, and passed on in the Lok Sabha (Lower House of Indian Parliament) on January 8, 2019, following the submission of a Joint Parliamentary Committee report on January 7, 2019] were heading towards Raj Bhavan (the official residence of the State’s Governor). On January 14, 2019, four persons, including two women, were injured during a Police crackdown in Imphal, the State capital, on protesters demanding scrapping of the Citizenship (Amendment) Bill. On January 11, 2019, four protestors were injured after Police used tear gas to stop a student protest rally against the Citizenship (Amendment) Bill in Imphal city. The rally was organised by Joint students’ body that included the All Manipur Students Union (AMSU), Apunba Irreipakki Maheiroising Singpanglup (AIMS), Democratic Students Alliance of Manipur (DESAM), Manipur Students Federation (MSF), Kangleipak Students Federation (KSF) and Studentcs Union of Kangleipak (SUK). Manipur has been witnessing sporadic protests since January 8, 2019, when the Lok Sabha passed the contentious Bill. According to media reports, the Bill was supposed to be tabled in the Rajya Sabha (Upper House of Indian Parliament) on January 9, 2019, but was deferred. There is speculation that the Bill might be tabled during the Budget session starting from January 31, 2019. 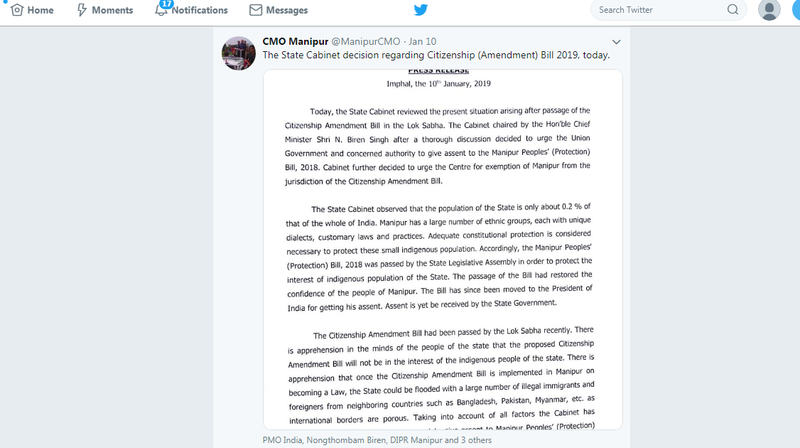 The Manipur People’s (Protection) Bill, 2018, was passed in the State Assembly to regulate entry and exit of non-Manipuris from outside the State. According to partial data compiled by South Asia Terrorism Portal, 201 persons have been detained for suspect nationality in the State in the year 2018. No further information regarding the status of these detainees is available. These initial murmurs against the Citizenship (Amendment) Bill, need, to be carefully considered by the Governments – Centre and State, as they have the potential to reignite simmering ethnic sentiments and conflicts across the State. Meanwhile, insurgency-linked violence in Manipur has ebbed considerably in recent times, but maintains cyclic trends. According to partial data compiled by the Institute for Conflict Management (ICM), 23 fatalities [seven civilians, seven Security Force (SF) personnel, and nine militants) were recorded in the State in 2018. Through 2017, the State recorded 55 fatalities (23 civilians, nine SF personnel, and 23 militants). Overall fatalities thus witnessed a decline of approximately 58.1 per cent in 2018 as compared to 2017. No such fatality has been recorded in the State in the current year, thus far (data till January 20, 2019). Overall fatalities in the State were the lowest in 2018, since 1992. A previous low of 33 was recorded in 2016. At the peak of insurgent violence in 1997, the State registered 495 fatalities. Fatalities across all three categories have registered decline. More significantly, in 2018, Manipur recorded the lowest civilian fatalities witnessed in a year since 1992. A previous low of 14 civilian fatalities was recorded in 2016. At its peak, the State had recorded 226 civilian fatalities in 1993. Fatalities among SFs in 2018 were the second lowest since 1992. The lowest recorded was in 2013, when six SF personnel were killed. A maximum of 111 SF personnel were killed in 1997. The number of militants killed in 2018 was, again, the second lowest in a year since 1992. A previous low of eight was recorded in 2016. The State recorded 341 militants killed in 2008, the highest in a year since 1992. 22 incidents of insurgency-related killing were recorded in 2018 as compared to 37 such incidents in 2017. Incidents of killing were reported from eight of the State’s 16 Districts in 2018. Noney District recorded the highest fatalities, seven in seven incidents; followed by Imphal West, five in five incidents; Chandel, three in three incidents; Churachandpur, two in two incidents, Kangpokpi, two in two incidents; Thoubal, Tegnoupal and Kamjong one each. In 2017, incidents of killing were reported from 10 of the State’s 16 Districts. The six Hill Districts (dominated mainly by Naga and Kuki tribes) accounted for 69.56 per cent of total insurgency-linked fatalities (16 out of 23) in 2018. There were no fatalities in the remaining four Hill Districts (Senapati, Pherzawl, Ukhrul and Tamenglong). Manipur currently has a total of 10 Hill Districts: Chandel, Tamenglong, Senapati, Ukhrul, Pherzawl, Noney, Tegnoupal, Kangpokpi, Kamjong and Churachandpur. Significantly, five of the current 10 Hill Districts are along the porous and volatile Indo-Myanmar border, increasing their vulnerability. Two Valley Districts (Imphal West and Thoubal) registered the remaining 30.43 per cent of fatalities (seven of 23) in 2018. In 2017, seven of the State’s 10 Hill Districts accounted for 74.5 per cent of total fatalities (41 out of the total 55 fatalities). The Districts where fatalities were recorded in 2017 were Kamjong, Tegnoupal, Kangpokpi, Churachandpur, Chandel, Ukhrul and Noney. There were no insurgency linked fatalities in the remaining three Hill Districts, Senapati, Pherzawl and Tamenglong. Three Valley Districts – Imphal West, Jiribam and Bishnupur – registered the remaining 18.1 per cent of fatalities (10 of 55) in 2017. The location of the remaining four militant fatalities could not be conclusively determined. In 2018, four SF personnel were killed and another 30 persons (14 civilians and 16 SF personnel) were injured in 19 incidents of explosion. In 2017, seven lives (six SF personnel and one militant) were lost and 62 persons were injured in 39 incidents of explosion. Incidents of fratricidal killings by insurgents also recorded a decline. Six militants died in six such incidents in 2018 as against 19 such fatalities in 10 incidents in 2017. Meanwhile, the SF drive against militants in the State led to the arrest of 172 militants in 2018, adding to 177 arrested in 2017. In one of the prominent incidents, the National Investigation Agency (NIA) arrested the ‘chairman’ of the Kuki Revolutionary Army (KRA), David Hangshing, on August 25, 2018, in connection with the a case of missing arms from the Police armoury. Several areas of concern, nevertheless, persist. 24 persons (in 12 incidents) were abducted in 2018 as against 23 (in 13 incidents) in 2017, according to partial data compiled by SATP. SFs rescued 12 persons, another nine were released, while the whereabouts of the remaining three are not known. Incidents of abduction and extortion are grossly underreported. Continued incidents of abduction-for-ransom clearly demonstrate that militants still have significant presence. The porous Indo-Myanmar border facilitates militant movement. Active militant formations have moved their camps further inside Myanmar following the cross-border raids in June 2015. An unnamed Indian Army officer, on the condition of anonymity, stated, in November 2018, “Insurgent groups have moved deeper into Myanmar” following the strikes. The Naga Framework Accord and its possible implication on Manipur’s territorial integrity continue to raise suspicions in the Valley Districts. The submission of a report by the Parliamentary Standing Committee on the framework agreement in July 2018, once again, raised alarm. In the report, the Government’s interlocutor for Naga talks, R.N. Ravi, had said that a “special status” would be offered to the Naga people by extending Article 371 (A) to Naga-inhabited areas. Further, the Suspension of Operations (SoO) with the Kuki militant conglomerates Kuki National Organisation (KNO) and the United People’s Front (UPF), was extended on September 2018. The SoO Agreement now will be valid till August 31, 2019. The talks with the group, according to news reports, remain at a preliminary stage. KNO ‘president’ P.S. Haokip disclosed, on September 13, 2018, that substantive talks were yet to begin and the groups’ principal demand for a “territorial council” will be placed before the Government whenever the next round of talks are held. Moreover, the issue of the politico-administrative status of the Hill Districts remained unresolved since the creation of new Districts. The 10th round of the tripartite talks between the Centre, State Government, and United Naga Council (UNC), held at the Senapati District headquarters town on September 1, 2018, remained inconclusive. According to news reports, the State Government made a request for more time, during the tripartite talks, to come up with concrete proposals regarding the UNC’s demand for a roll-back of the decision Notification of District creation] of the previous Ibobi Singh-led State Government to create seven new Districts in the State in 2016. In November 2018, General Officer Commanding of the 57 Mountain Division, Major General V.K. Mishra observed, “The presence of so many groups adds to the complexity… Given the complexity of the problem, it may take longer to achieve a solution”. The 57 Mountain Division of the Indian Army, based in Leimakhong, is involved in counter-insurgency operations in the State. Nevertheless, the relative peace over the years has opened up spaces for development work. A slew of projects, totalling INR 15 billion, were inaugurated by Prime Minister Narendra Modi on January 4, 2019. The projects include an Integrated Check Post (ICP) at Moreh in Tengnoupal District near the Indo-Myanmar border; the Dolaithabi barrage in Kangpokpi District; a Food Corporation of India (FCI) storage godown in Imphal East District; a buffer water reservoir at Shirui village in Ukhrul District; upgraded water supply for Churachandpur (zone-III) in Churachandpur District; an eco-tourism complex at Thangal Surung in Kangpokpi District; an integrated tourist destination at Tupul in Noney District; and the water supply scheme at Jawahar Navodaya Vidyalaya located in Lambui in Ukhrul District. Prime Minister Modi also dedicated a 400kV double-circuit Silchar-Imphal power transmission line to the nation. The qualified peace achieved in the State needs to be carefully nurtured, as emotive issues related to land and identity are involved in the many latent and low grade conflicts that exist in Manipur. The passage of Citizenship (Amendment) Bill in the Lok Sabha is an unwise move that threatens the fragile equilibrium that has been established in the State after decades of violent armed conflict and political turmoil. It remains to be seen whether the current regime at the Centre has the sagacity to bring reason back into its calculus, or persists in its short-term electoral politics of communal polarization, which appears to be the principal motive behind the Citizenship Amendment Bill.